This is a follow-up to a post I made on November 29th, Bitcoin and Cryptocurrency Investing for Beginners. I’m still learning as I go, and I want to share what I’m learning. Before we get started, I want to point out the Disclaimers section below. Please read that. Also, please note that much of what I reference (and more) is in a links section at the bottom of this post. In my previous post (linked above), I went over the basics and won’t be repeating it here, so if you need a refresher, please check out that post. Here, I want to supplement that with some of what I’ve been realizing over the last month or so. Most notable is that an exchange like CoinBase is really expensive to send small amounts of coin from. Last night, I wanted to send $45 of Bitcoin to another exchange in order to purchase a small amount of alt coin and the fee was going to be $17. If you’re going to buy Bitcoin to hold, try to move it all in one transaction or at least larger transactions. For example, if I’m moving $1,700 of BTC to cold storage, $17 is only 1% for the fee and I can deal with that. On the other hand, $17 out of $45 is over 33% and unacceptable. I decided to pass on that transaction. For smaller transactions, it makes more sense to move some investment amount of BTC to an exchange with smaller fees or use a different coin with lower fees for investments. If you’re already working with cheaper options, please comment below. As above, my previous post (linked above) covered the basics of mining and I remain firm on most of that, but have a little to add. A couple people have recently told me that they’re stopping mining the small alt coin they had been mining at home due to the electricity costs. In some cases, I agree with the thinking. Other times, I think about how I was mining Bitcoin when it was less than a dollar per coin and quit for the same reason. To that end, I would advise you to not waste time mining anything you don’t believe in. It may be tempting to mine something that easily yields 100 coin a day from your home computer, but if you never recuperate the money spent on electricity and the value of your time, it’s a loss. Mining something more established like Monero is good, but you may end up in the same boat. I would look at new coins and what they offer in the same way you should when buying alt coins (see below) and get in early on one of those if you’re going to home-mine at all. And speaking of cloud mining… I have been using Hashflare since November 29th, so about 5 weeks. I started with 2.5 TH/s (Terahash per second) and have since bought more with my own money, but I’m also rolling any BTC I get from mining back into more contracts, compounding my returns. Of course, this means that I don’t have any ROI at all until I stop rolling in profits, but when I do, the returns will be exponentially greater. 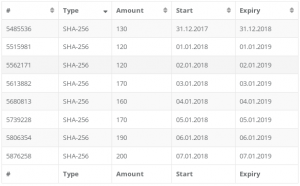 Below are screen grabs showing my current mining on this account and my last handful of contracts to give you an idea of how much you can roll back in at this level. If I started cashing out now, I’d have an estimated $17,000 after a year (at today’s Bitcoin price). If I compound for a year or two first, the return is in the 6-7 figure range. In the first image below, the little mountain around Dec 31st is me holding the Bitcoin in my account for a couple days instead of re-investing it because it was in a big dip. Please bear in mind that I have a little over $2,200 of my own money (alt coin profits, really) into this account. Rolling profits back in is definitely helping it grow, but it wouldn’t be this big just from my initial 2.5 TH/s buy. 18.9 TH/s was purchased between November 29 and December 5th. Since then, the rest of the growth has just been compounding returns. To give you an idea of a more realistic beginner scenario, I created an experimental account on December 20th with 2 rules. First, I will only invest $150 or less of my own money to get it started. Second, I will roll in all profits automatically to grow the account until I feel it’s worth cashing out. The initial purchase was 0.66 TH/s for $145.20. 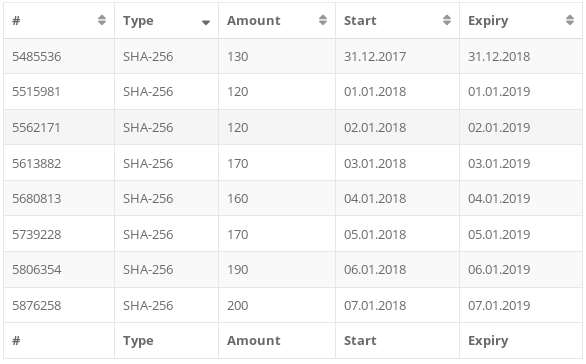 Today, it has rolled in nine additional contracts of 0.01 TH/s each for a total of 0.75 TH and I expect it to reach the point of being able to buy a new contract every day within the next 2-3 weeks. Obviously, it will take a long time for that to roll into a substantial amount, but it’s a small amount to test the waters. I preferred to dive in and grow it faster on my primary account. I’ve also had a friend tell me she started with a simple 0.01 TH purchase for a couple bucks. 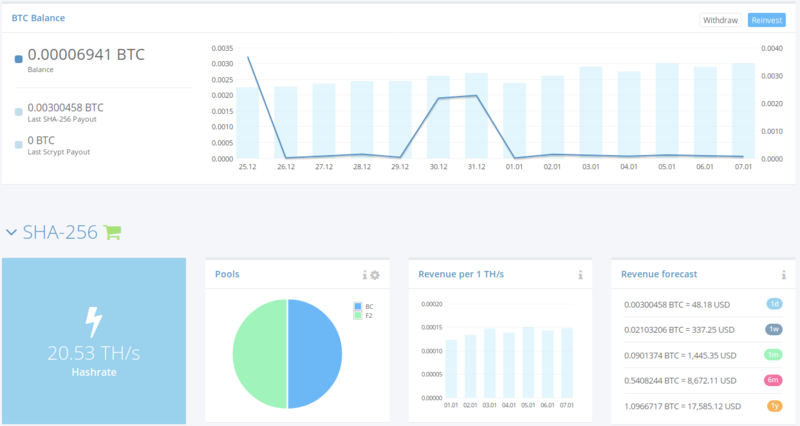 Hashflare is established, but there’s no absolute guarantee that they’ll be around forever or that the Bitcoin difficulty or price won’t turn against your ROI. I obviously have a high amount of confidence in it. That said, there are other cloud mining operations you can consider, but that I have not personally used, including Genesis, Sun, Nuvoo, etc. It’s also worth noting that you pay for mining power in contracts and not all companies are the same. For example, at the time of this writing, Hashflare’s contracts are for one year while Sun and Genesis contracts are for three years. The coins that got us all started were Bitcoin, Etherium, and Litecoin. You’ll hear a lot about all three because they’ve been around for a long time. Everything other than Bitcoin – arguably, Etherium and Litecoin call into this list – is considered by most to be an “alt coin” or “alternative coin”. There are many in the space that consider most alt coins to be trash, and I largely subscribe to this thinking, but with two caveats. First, there are some alt coins worthy of looking at and investing in based solely on their usefulness, especially if you come across them early. Second, there are some coins that may have no real value, but can still generate profit for you (more on that in a bit). Everything else, yeah… pretty worthless, which brings me to ICOs. ICO stands for Initial Coin Offering. Much like the stock market’s IPOs, an ICO raises money for it’s company and instead of stock shares, you get coins. The problem with ICOs is that most of them dive in value after you’ve spent your money and you either panic sell at a huge loss or you’re left holding a bunch of mostly worthless coins, waiting for a comeback. There may be ICOs worth investing in, but I’ve yet to participate in any. As for alt coin buying outside of ICOs, I have bought and sold enough to recommend it. It’s just as risky as everything else, but maybe a little more exciting. In many cases I would trade $20-$100 of Bitcoin for a bunch of alt coins and then sell them a week later for 100% profit. There are a few that dropped and I got rid of them when they leveled back out, but I haven’t lost any money there (lucky, perhaps). Of course, there are cases like Stellar Lumens where I bought 10,000 at 2 cents, sold at 3 cents and then watch a month or two later in horror as it went to 86 cents. But you can’t buy on emotion or hold on fear of missing the big payoff. Just learn about the coin, carefully distinguish rumors from news, and act accordingly. I’m holding a substantial amount of alt coins and will probably just keep the rest until the value makes impossible to resist selling. Check out the CoinMarketCap site linked below for some lists and resources. This should go without saying because it applies to anything you need to log into online, but don’t get lazy with your security. Use secure passwords and use a different password for each site. Although I’ve seen some in the cryptocurrency space say not to, I think a password manager is a great way to help keep it all organized. The argument against it is that if someone gets into your password manager, they have access to all your accounts. First, that’s only true of accounts that don’t have 2FA set up (more on that below) and second, if you choose one very good pass phrase for your password manager, you can mitigate some of the risk of someone getting into your account. Personally, I think this approach is less risky than using the same password everywhere, using weak passwords that are easy to remember (and easy to crack) or writing all your passwords down on paper. Now, let’s talk about 2FA which means Two Factor Authentication. When you enable 2FA on a site, you have to provide the login and password and also provide another form of authentication which is generated and sent to you at the time of logging in. Duo and Google Authenticator are two apps that are widely used for this secondary verification. For either of those, you would log into the website and then it would generate a six digit code and send it to you through the Duo or Google Authenticator app. Then you have 60 seconds to enter the code. Less secure methods of 2FA include sending codes to you via email or text message. These are less secure because email is often hacked and cell phone providers can be tricked into porting your phone number to a hacker’s device. There’s ways to protect against those things, but that’s for another post. If you sign up for an account somewhere and the compromise of that account could be devastating, turn on 2FA. Of course, a common suggestion among those in this industry is to never leave your currencies in an exchange and if you’re holding long term, put them in cold storage. If you’re planning on buying Bitcoin and using it to actually pay for things (mining services, goods, alt coins, etc), it’s a good idea to move it away from the exchange and into a software wallet. Blockchain.info seems to be a decent online wallet I’m just getting familiar with. Admittedly, I had been leaving everything in the exchange, but recently moved away from that strategy. Coinbase does have a “vault” option that makes it a little more secure, but exchanges get hacked and when they lose your currency, it’s gone. BuyBitcoinsWorldWide (linked under Resources below) has a decent guide to cryptocurrency wallets and how they work. This includes cold storage, which is a means of keeping your cryptocurrency completely offline. In this way, you take away the ability for a thief to hack in and steal what you’re holding. This is something I’ve also just invested in and it strongly advised if you have a notable amount of crypto you plan to hold for a while. Below, you’ll find links to Trezor, KeepKey, and Ledger Nano S hardware cold storage wallets. If you’re looking for something free, you can try the link to create a paper offline wallet. This is by no means an exhaustive or all-inclusive list, but should be treated as a starting point and, in some cases, just examples of the options available. Iâ€™m not an accountant, financial advisor, crypto expert, finance guru, or college graduate. The stuff I talk about above is from my own limited experience and research. Youâ€™re urged to always do your research and educate yourself. If a site I use has an affiliate link, I use it. Not doing so is just throwing away money, but I do only link out to sites I would even if they didn’t have an affiliate program and I give my honest opinions about them either way. This links will be noted with (affiliate) after them for transparency. Finally, while you can make a lot of money in the cryptocurrency space, you can also lose a lot. Approach this new world with an open mind, but also with an ounce of caution and skepticism.